Chromatin-associated non-coding RNAs modulate the epigenetic landscape and its associated gene expression program. 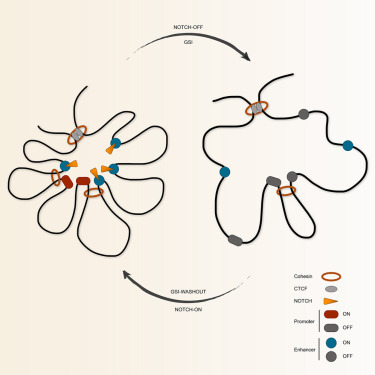 The formation of triple helices is one mechanism of sequence-specific targeting of RNA to chromatin. With this study, we show an important role of the nucleosome and its relative positioning to the triplex targeting site (TTS) in stabilizing RNA-DNA triplexes in vitro and in vivo. Triplex stabilization depends on the histone H3 tail and the location of the TTS close to the nucleosomal DNA entry-exit site. 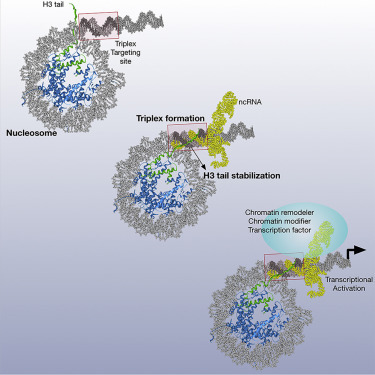 Genome-wide analysis of TTS-nucleosome arrangements revealed a defined chromatin organization with an enrichment of arrangements that allow triplex formation at active regulatory sites and accessible chromatin. We further developed a method to monitor nucleosome-RNA triplexes in vivo (TRIP-seq), revealing RNA binding to TTS sites adjacent to nucleosomes. Our data strongly support an activating role for RNA triplex-nucleosome complexes, pinpointing triplex-mediated epigenetic regulation in vivo. PARN loss-of-function mutations cause a severe form of the hereditary disease dyskeratosis congenita (DC). PARN deficiency affects the stability of non-coding RNAs such as human telomerase RNA (hTR), but these effects do not explain the severe disease in patients. We demonstrate that PARN deficiency affects the levels of numerous miRNAs in human cells. 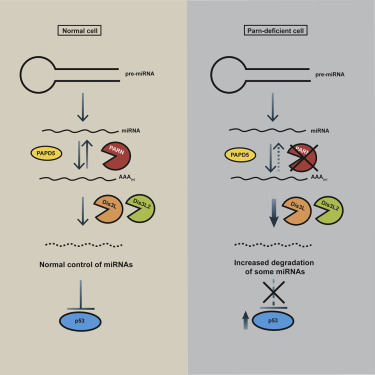 PARN regulates miRNA levels by stabilizing either mature or precursor miRNAs by removing oligo(A) tails added by the poly(A) polymerase PAPD5, which if remaining recruit the exonuclease DIS3L or DIS3L2 to degrade the miRNA. PARN knockdown destabilizes multiple miRNAs that repress p53 translation, which leads to an increase in p53 accumulation in a Dicer-dependent manner, thus explaining why PARN-defective patients show p53 accumulation. 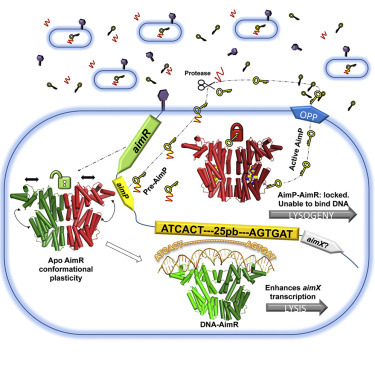 This work also reveals that DIS3L and DIS3L2 are critical 3′ to 5′ exonucleases that regulate miRNA stability, with the addition and removal of 3′ end extensions controlling miRNA levels in the cell. The C-terminal domain (CTD) of RNA polymerase II (Pol II) is composed of repeats of the consensus YSPTSPS and is an essential binding scaffold for transcription-associated factors. Metazoan CTDs have well-conserved lengths and sequence compositions arising from the evolution of divergent motifs, features thought to be essential for development. On the contrary, we show that a truncated CTD composed solely of YSPTSPS repeats supports Drosophila viability but that a CTD with enough YSPTSPS repeats to match the length of the wild-type Drosophila CTD is defective. Furthermore, a fluorescently tagged CTD lacking the rest of Pol II dynamically enters transcription compartments, indicating that the CTD functions as a signal sequence. However, CTDs with too many YSPTSPS repeats are more prone to localize to static nuclear foci separate from the chromosomes. We propose that the sequence complexity of the CTD offsets aberrant behavior caused by excessive repetitive sequences without compromising its targeting function. Bacillus phages use a communication system, termed “arbitrium,” to coordinate lysis-lysogeny decisions. Arbitrium communication is mediated by the production and secretion of a hexapeptide (AimP) during lytic cycle. Once internalized, AimP reduces the expression of the negative regulator of lysogeny, AimX, by binding to the transcription factor, AimR, promoting lysogeny. We have elucidated the crystal structures of AimR from the Bacillus subtilis SPbeta phage in its apo form, bound to its DNA operator and in complex with AimP. AimR presents intrinsic plasticity, sharing structural features with the RRNPP quorum-sensing family. Remarkably, AimR binds to an unusual operator with a long spacer that interacts nonspecifically with the receptor TPR domain, while the HTH domain canonically recognizes two inverted repeats. AimP stabilizes a compact conformation of AimR that approximates the DNA-recognition helices, preventing AimR binding to the aimX promoter region. Our results establish the molecular basis of the arbitrium communication system. Chromatin loops enable transcription-factor-bound distal enhancers to interact with their target promoters to regulate transcriptional programs. Although developmental transcription factors such as active forms of Notch can directly stimulate transcription by activating enhancers, the effect of their oncogenic subversion on the 3D organization of cancer genomes is largely undetermined. By mapping chromatin looping genome-wide in Notch-dependent triple-negative breast cancer and B cell lymphoma, we show that beyond the well-characterized role of Notch as an activator of distal enhancers, Notch regulates its direct target genes by instructing enhancer repositioning. Moreover, a large fraction of Notch-instructed regulatory loops form highly interacting enhancer and promoter spatial clusters termed “3D cliques.” Loss- and gain-of-function experiments show that Notch preferentially targets hyperconnected 3D cliques that regulate the expression of crucial proto-oncogenes. Our observations suggest that oncogenic hijacking of developmental transcription factors can dysregulate transcription through widespread effects on the spatial organization of cancer genomes. Mitochondria import nearly all of their resident proteins from the cytosol, and the TOM complex functions as their entry gate. The TOM complex undergoes a dynamic conversion between the majority population of a three-channel gateway (“trimer”) and the minor population that lacks Tom22 and has only two Tom40 channels (“dimer”). Here, we found that the porin Por1 acts as a sink to bind newly imported Tom22. This Por1 association thereby modulates Tom22 integration into the TOM complex, guaranteeing formation of the functional trimeric TOM complex. Por1 sequestration of Tom22 dissociated from the trimeric TOM complex also enhances the dimeric TOM complex, which is preferable for the import of TIM40/MIA-dependent proteins into mitochondria. Furthermore, Por1 appears to contribute to cell-cycle-dependent variation of the functional trimeric TOM complex by chaperoning monomeric Tom22, which arises from the cell-cycle-controlled variation of phosphorylated Tom6. The mitochondrial inner membrane harbors a large number of metabolite carriers. 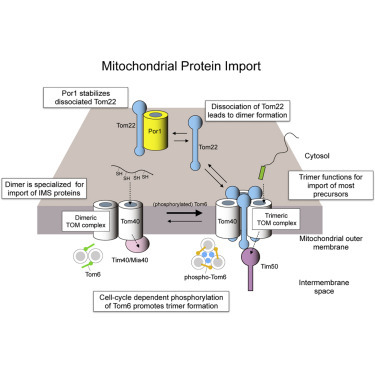 The precursors of carrier proteins are synthesized in the cytosol and imported into mitochondria by the translocase of the outer membrane (TOM) and the carrier translocase of the inner membrane (TIM22). Molecular chaperones in the cytosol and intermembrane space bind to the hydrophobic precursors to prevent their aggregation. We report that the major metabolite channel of the outer membrane, termed porin or voltage-dependent anion channel (VDAC), promotes efficient import of carrier precursors. 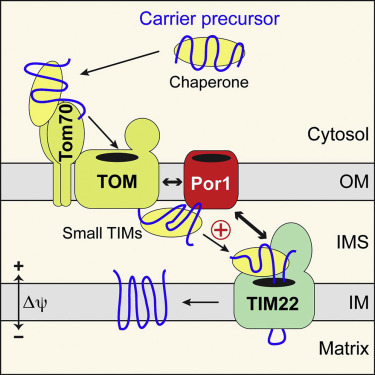 Porin interacts with carrier precursors arriving in the intermembrane space and recruits TIM22 complexes, thus ensuring an efficient transfer of the precursors to the inner membrane translocase. Porin channel mutants impaired in metabolite transport are not disturbed in carrier import into mitochondria. We conclude that porin serves distinct functions as outer membrane channel for metabolites and as coupling factor for protein translocation into the inner membrane. Displacement loops (D-loops) are pivotal intermediates of homologous recombination (HR), a universal DNA double strand break (DSB) repair pathway. We developed a versatile assay for the physical detection of D-loops in vivo, which enabled studying the kinetics of their formation and defining the activities controlling their metabolism. 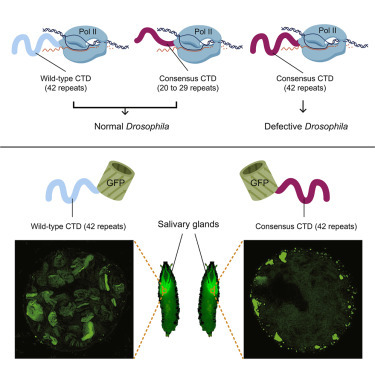 Nascent D-loops are detected within 2 h of DSB formation and extended in a delayed fashion in a genetic system designed to preclude downstream repair steps. 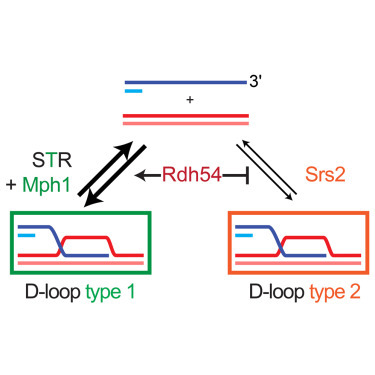 The majority of nascent D-loops are disrupted by two pathways: one supported by the Srs2 helicase and the other by the Mph1 helicase and the Sgs1-Top3-Rmi1 helicase-topoisomerase complex. Both pathways operate without significant overlap and are delineated by the Rad54 paralog Rdh54 in an ATPase-independent fashion. This study uncovers a layer of quality control of HR relying on nascent D-loop dynamics. If you don’t see any content on this page, our service is temporarily unavailable. Please come by another time.